Comments Off on Choosing the RIGHT Microsoft Dynamics Partner Can Mean the Difference Between a Good or Bad Implementation and Long-term Success. Choosing the RIGHT Microsoft Dynamics Partner Can Mean the Difference Between a Good or Bad Implementation and Long-term Success. Customer satisfaction is monitored by Microsoft. The partner you choose should be a “Managed Partner” for Dynamics GP by Microsoft. This assures access to local Microsoft resources and response to your needs by a team that is incented to work with you. Years in business and years of Microsoft Dynamics Experience – more is better. The average life of a Microsoft Dynamics GP partner is less than 4 years. Many partners have come and gone over the years. Many have closed their doors, sold, merged or have been acquired. Many of these players have resurfaced with new company names and new faces, leaving clients with broken partnerships and promises. Breadth of experience. Make sure partner has specialist and certified professionals for core competencies (Financial, Distribution/Manufacturing, Supply Chain, Payroll/Human Resources, CRM, etc.) around Dynamics. Rights to the Microsoft Dynamics GP Source code license. This allows the partner you are working with to provide quicker support and provide customizations at lower costs. Partner Advantage Support. This is the highest level of support a partner can get from Microsoft for Dynamics. Your partner should have a contract with Microsoft for this level of Dynamics GP support. This provides the partner 24x7, level II one hour response times. Otherwise, 3 hour estimated response times is the norm, 8-5, level one support (less than the level of support a client can contract for). Microsoft Certified Sales Professionals. Partners with this position are allowed to provide clients with special offers on licenses and Microsoft services. Dedicated Client Account Manger (often referred to as a Customer Sales Manager, CSM, within the Microsoft Dynamics community). Partners that have CSMs value long-term relationships with customers and hold events to ensure your organization stays on top of the latest features and functionality long after go-live. Microsoft Sure Step Methodology for implementations. This methodology ensures confidence that implementations will go smoothly, be consistently replicated, and have predictable outcomes. 10. Reasonable travel time and travel expense charges. These charges can add as much as a 50% to 100% surcharge to the effective hourly rate. 11. Relationships with all of the Dynamics GP Independent Software Vendors (ISV) related to your implementation. Make sure your new partner has a positive previous working relationship with these vendors. Written by Tracy Remington. Contact InterDyn – Remington Consulting for your Microsoft Dynamics GP, AX or CRM implementations. 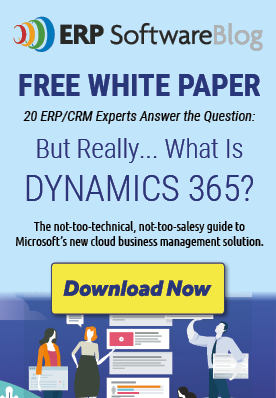 Posted in ERP Software Information | Comments Off on Choosing the RIGHT Microsoft Dynamics Partner Can Mean the Difference Between a Good or Bad Implementation and Long-term Success.